Victoria’s Leigh Griffin and Browns Bay’s Elaine McClintock had contrasting paths but have both found themselves in the women’s singles final at the New Zealand bowls championships on Auckland’s North Shore. In the semifinals on Thursday, Griffin led throughout to deny the 2014 runner-up Tayla Bruce (Burnside) 21-14. But McClintock trailed for the vast majority of her semi against New Zealand squad member Angela Boyd (Burnside), before storming home to win 21-20. The final will be played on Sunday morning. 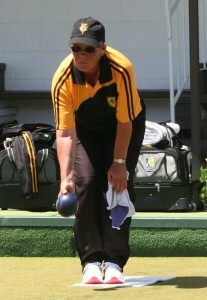 Griffin has secured 25 Wellington titles during her 29 years in the game, which started at Titahi Bay. She played with plenty of confidence and accuracy this morning to keep the talented Bruce at bay. After Griffin led 13-6, Bruce staged a mini fightback closing to 13-11. But Griffin was playing more steadily and in winning six of the next seven ends, opened up a 20-12 advantage. Bruce kept the game alive with two singles and held two, possibly three, shots on the next end before Griffin drew the shot brilliantly, and with great delight, with her final bowl to secure her first position in a national final.